Visit many different countries of the world and you will find a common creeping plant. Found in areas such as Macaronesia, Africa, Asia, Japan, Taiwan, Europe, and the United States, Fresh Topiary Ivory plants are adored worldwide. Designers and homeowners often use these versatile plants in a number of different settings and designs. The unique qualities of these Topiary Trees allow you to create many different designs and shapes. Arrange these beautiful plants for a truly unique addition to any design plan. These Live Topiary Trees are hearty and easy to care for. They do enjoy a hearty watering, but need to be allowed to dry out moderately between waterings. It is not recommended that the roots be exposed to excess water. This will cause the roots to rot and the plant will ultimately die. With the correct amount of moisture and light, these Live Topiary Trees will last many years. This Fresh Topiary is shipped in a four and a half inch plastic pot. 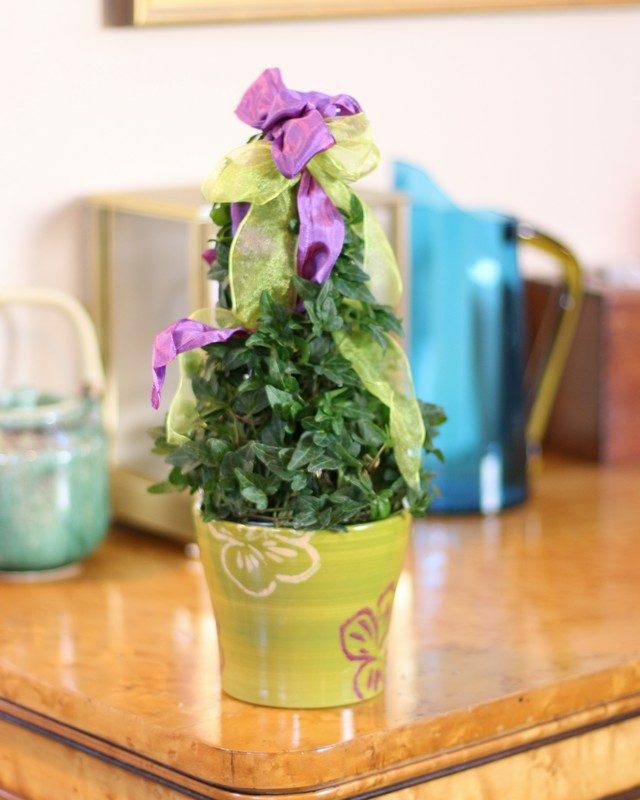 This Fresh Topiary can also be shipped in a four and a half inch Terracotta pot or with Mylar wrapping around the bottom of the pot as an option. Both of these options are invaluable if this plant is to be sent to someone as a gift. The height of this plant is 1.25 lb. The vines of this plant will grow to very long lengths if allowed. This growing pattern will fill up any topiary stand or intended area quickly. These Topiary Trees are perfect for indoor growing where they prefer temperatures between 40 and 80 degrees F. Continually winding new growth around the forms will produce incredible visually stunning arrangements. The vines of this plant can be led to follow the pattern of a wire or plastic element in an arrangement or a display. This can either be a hand made form or purchased from a local retailer that sells gardening supplies. Many of these forms are in the shapes of balls, hearts, triangles, or hand forged wire animals. With some imagination this Fresh Topiary can be transformed into any design or shape that you create. Landscapes and interior designs will benefit from the introduction of these Ivy Topiary Trees. Landscape and home designs will be enhanced with the beauty of this elegant and delicate looking plant. Let it grow wild and free or tame it into the shape and design that you desire. When it comes to this Fresh Topiary, the beauty and elegance can not be beat.